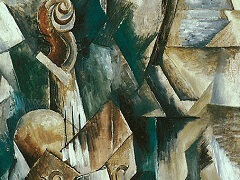 This work embodies the dynamic and energetic qualities of Analytic Cubism, a revolutionary artistic style pioneered by Georges Braque and Picasso to depict three-dimensional objects on a flat canvas without the use of traditional Renaissance perspective. 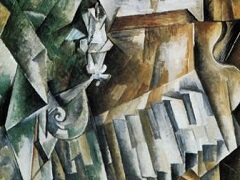 In this conceptual approach to painting, perceived forms are broken down, fractured, flattened, and then reconstructed in multiple-point perspective within a shallow space. 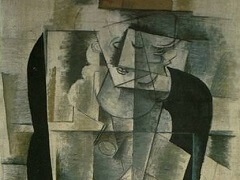 Braque described this kind of fragmentation as "a technique for getting closer to the object." 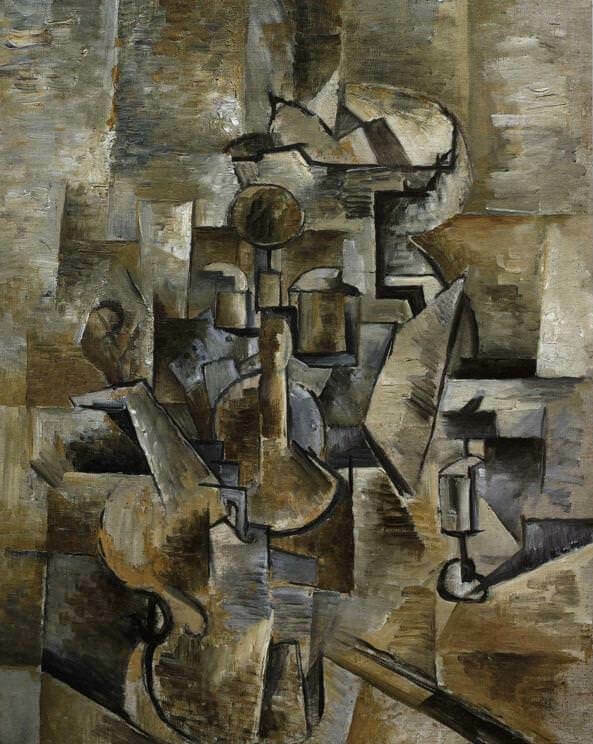 Violin and Candlestick was an outcome of Georges' obsession for form and stability, fuelled with a desire to create an illusion in a viewer's mind to move around freely within the painting. 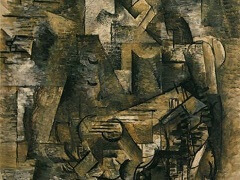 To achieve this, the painter conglomerated the subjects at the centre of a grid like armature & covered the boundaries of the black-outlined objects using earth-toned colors. 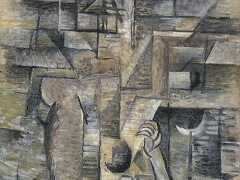 Thereby, he managed to transform the volumes of static to hold compound surfaces on a flat plane, enabling onlookers to appreciate more of form compared to any other angle. 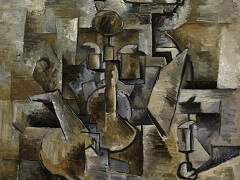 Recognizing and understanding the effects of light astutely to elicit the appropriate emotions and effects of the subjects also served as a vital parameter for Braque's Violin and Candlestick. Here, still-life props (some recognizable and some impossible to identify) are clustered toward the center of a gridlike armature. 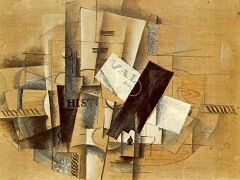 Braque united the objects and the background by opening up and covering over the boundaries of the black-outlined objects, and by using the same earth-toned colors for the entire painting. 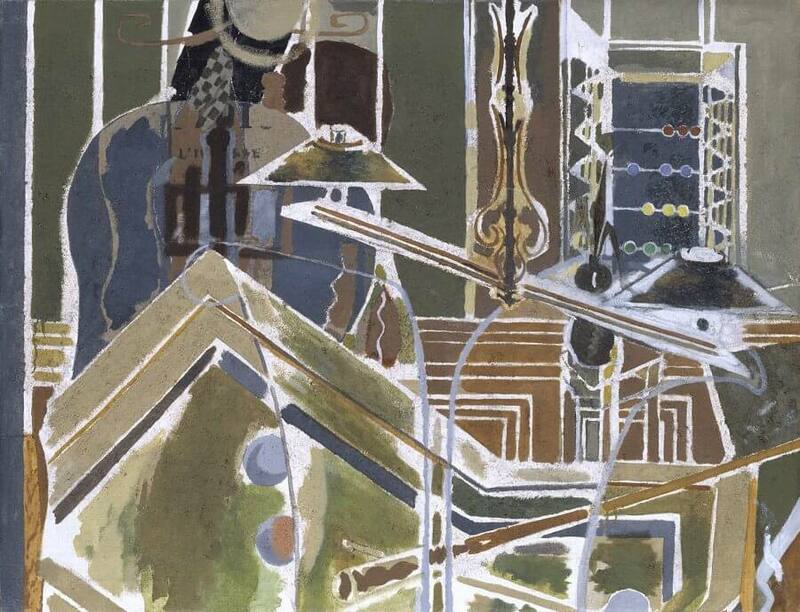 He transformed volumes in the still life to accommodate their multiple surfaces on a flat plane, thereby allowing the viewer to see more of the form than would be possible from a single vantage point.